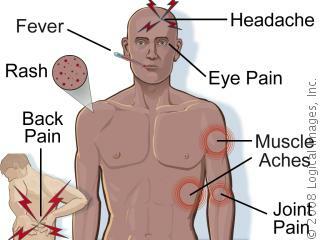 Dengue fever starts with headache, chills, pain in eye movement and low backache. During first few hours of illness, pain in legs occurs. The temperature rises up to 104 F with low blood pressure and low heart rate. Eyes become red. Pink rash flushes on face. Glands in groin area and neck are swollen. Fever lasts for four to five days and then drop by profuse sweating. A period of well-being starts after the temperature drops.